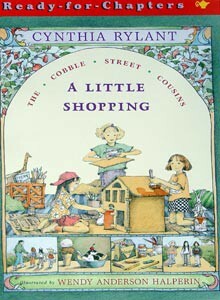 Meet The COBBLE STREET COUSINS Lily, who wants to be a poet Tess, who wants to be a Broadway star Rosie, who wants a little cottage with flowers by the door. Lily has a wonderful idea -- to surprise Aunt Lucy with a dollhouse that looks just like her flower shop. But first the girls have to buy a few things at The Olde Craft Shoppe, and with the Cobble Street Cousins, even a little shopping trip can turn into an adventure! Ages 7-10. 64 pages.